Standard Check in Time at the hotel 1400 hours / Check out 1200 hours. In the afternoon proceed for the sightseeing of old delhi and new delhi, the Red Fort (photo stop from outside), Jama Mosque, Chandni Chowk and Raj Ghat .. In the seventeenth century, the Mughal emperor, Shah Jahan, made his capital in Shahjahanabad, the area that largely covers the current old Delhi, also called the walled city. Jama Masjid is the largest and most known mosque in India. It is flanked by a strong red on one side and the old city Chandni Chowk on the other. Built by Shah Jahan in the seventeenth century, Jama Masjid is one of the busiest destinations in Delhi for pilgrims and tourists. They also have an external look of the strong red. 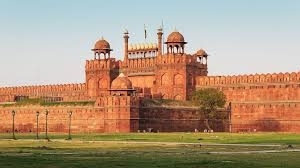 The Red Fort was built by the Mughal emperor Shah Jahan in the seventeenth century which took about 9 years to complete this magnificent structure and about 10 million rupees to build the fort. Chandani Chowk The Delhi bazaar novel can best be experienced in Chandni Chowk and around the streets. According to legend, the Chandni Chowk market was established during the reign of Mughal emperor Shah Jahan. Raj Ghat Later visit Raj Ghat, Mahatma Gandhi's resting place. Raj Ghat recalls the man who is known as the Father of the Nation for his tireless and pacifist work to restore India's independence. India Gate At the centre of New Delhi stands the 42 m high India Gate, an "Arc-de-Triomphe" like archway in the middle of a crossroad. Almost similar to its French counterpart, it commemorates the 70,000 Indian soldiers who lost their lives fighting for the British Army during the World War I. The memorial bears the names of more than 13,516 British and Indian soldiers killed in the Northwestern Frontier in the Afghan war of 1919. President House- Home to the President of the world’s largest democracy, is emblematic of Indian democracy and its secular, plural and inclusive traditions. It was designed by Sir Edwin Lutyens and Herbert Baker and stands on a 330 acre estate. It took seventeen years to build this presidential palace which was completed in the year 1929. You visit Humayun's tomb, Humayun was the second Mughal Emperor of India who died in 1556 and his widow Hamida Banu Begam, also known as Haji Begam, began construction of his tomb in 1569, fourteen years after his death. Humayun's tomb is the first distinct example of a true mogul style, inspired by Persian architecture. 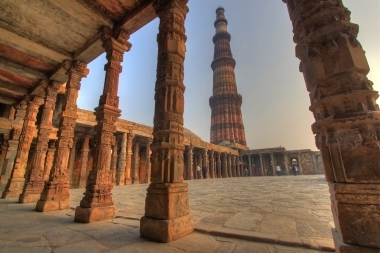 Later you will visit Qutab Minar. The Lotus Temple, located in Delhi, India, is a Bahá'í Adoration House dedicated in December 1986, completed for a total cost of 10 million dollars. It serves as the Mother temple of the Indian subcontinent. 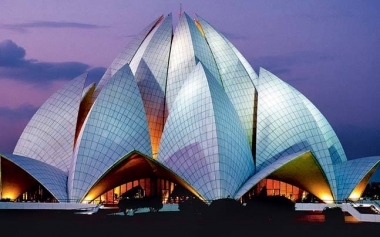 East of the place of Nehru, this temple is built in the shape of a lotus flower and is the last of the seven major Bahai temples built all over the world. Completed in 1986, it is surrounded by verdant green gardens. The structure is made of pure white marble. The architect Furiburz Sabha chose the lotus as a common symbol of Hinduism, Buddhist Jainism and Islam. 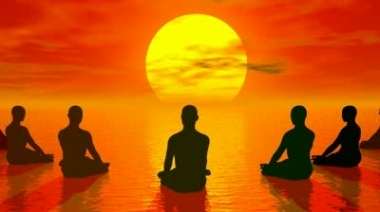 The adherents of every faith are free to visit the temple and pray or meditate. Around the flowery petals there are nine pools of water that glow in natural light. It looks spectacular at dusk when it is flooded. Agra Fort You go to visit the fort of Agra and the Taj mahal Nestled in the strong banks of the Yamuna River, this crescent shaped fort was commissioned by Akbar, one of the greatest Mughal emperors, in 1565. Surrounded by mighty ramparts, the complex has numerous palaces, gardens and halls within the fort. and other historical sites facilities. 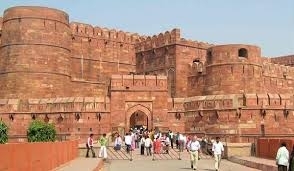 After the visit of the Agra Fort. You will be heading towards Taj Taj Mahal. 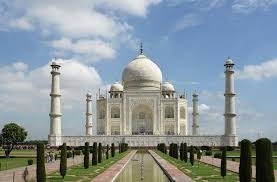 Taj Mahal is one of the seven wonders of the world and a must see place in India. He is the living specimen of the romantic life of Shah Jahan and his beautiful wife Mumtaz Mahal. The construction of this beautiful monument was completed in 1653 AD. King Mughal Sha Jahan built this as a final resting place for Queen Mumtaz. Fatahpursikri Built by the Mughal emperor Akbar in the mid-sixteenth century, Fatehpur Sikri was to be a new capital for his empire. Built in an almost uniform style, Sikri is a complex sprawling of palaces, mosques, temples and other structures. It is a wonderful fusion of Persian and Indian construction styles. Abhaneri was originally called Abha Nagri, which means "city of brightness", but due to erroneous declaration, the name has been changed. The city is now in ruins, but attracts tourists from all over the world. Abhaneri is prominent for the 'Baoris', wells that were invented by the natives to collect rainwater. These tanks were used as cold places of withdrawal and as water tanks during the periods of the year. Chand Baori is the most popular of the wells in the region, and is one of the deepest and largest in India. There are three ways to reach the water using the steps that are divided into stories. This colossal and delicately carved well is located in front of the temple of Harshat Mata. It was a ritual to wash the hands and feet at the well before visiting the adjoining temple. Amer Fort is a fortress located in Amer, Rajasthan, India. Amer is a city with an area of ​​4 square kilometers (1.5 square miles) located 11 kilometers (6.8 miles) from Jaipur, the capital of Rajasthan. Located at the top of a hill, it is the main tourist attraction in the Jaipur area. The city of Amer was originally built by Meenas, and was later ruled by Raja Man Singh I (December 21, 1550 - July 6, 1614). Amer Fort is known for its artistic elements in Hindu style. With its large ramparts and series of cobbled doors and paths, the fort overlooks Lake Maota, which is the main water source for the Amer Palace. Built of red sandstone and marble, the attractive and opulent building is laid out on four levels, each with a courtyard. It consists of the Diwan-i-Aam, or "Hall of Public Audience", the Diwan-i-Khas, or "Hall of Private Audience", the Sheesh Mahal (Palace of the Mirror), or Jai Mandir, and the Sukh Niwas where a cool climate is artificially created by the winds that blow over a cascade of water inside the building. 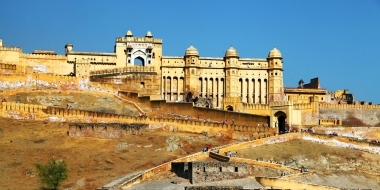 Thus, the Amer Fort is also popularly known as Amer Palace. The palace was the residence of the Rajput Maharaja and their families. At the entrance to the palace, near the Ganesh gate of the fort, there is a temple dedicated to Shila Devi, a cult goddess Chaitanya, who was given to Raja Man Singh when he defeated the Judah Raja in Bengal in 1604. (Jessore it is now in Bangladesh). This palace, together with the fort of Jaigarh, is immediately above on the Cheel ka Teela (Hill of the Eagles) of the same mountain range Aravalli. The palace and fort of Jaigarh are considered a complex, since the two are connected by an underground passage. This passage was intended as a way out in wartime to allow members of the royal family and others in the Fort Amer to move to the more formidable Fort Jaigarh. The annual tour of the Amer Palace was reported by the Superintendent of the Department of Archeology and Museums as 5000 visitors a day, with 1.4 million visitors in 2007 At the 37th session of the World Heritage Committee, held in Phnom Penh, Cambodia, in 2013, Amer Fort, along with five other Rajasthan forts, was declared a UNESCO World Heritage Site as part of the Hill Forts of Rajasthan group. City Palace, Jaipur, which includes the Chandra Mahal and Mubarak Mahal palaces and other buildings, is a complex of palaces in Jaipur, the state capital of Rajasthan, India. It was the seat of the Maharaja of Jaipur, the head of the Kachwaha Rajput clan. The Chandra Mahal palace now houses a museum, but most of it is still a royal residence. 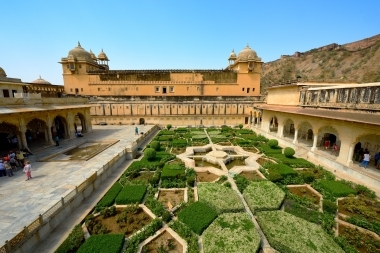 The palace complex, located north-east of the grilled city center of Jaipur, incorporates an impressive and vast array of courtyards, gardens and buildings. The palace was built between 1729 and 1732, initially by Sawai Jai Singh II, the ruler of Amber. He designed and built the outer walls, and subsequent additions were made by successive rulers who continued until the twentieth century. The merit of the urban layout of the city and its structures is attributed to two architects, Vidyadhar Bhattacharya, the main architect of the royal court and Sir Samuel Swinton Jacob, in addition to the same Sawai who was an architecture lover. The architects created a fusion of the Shilpa Shastra of Indian architecture with Rajput and Mughal. Jantar Mantar is an equinoctial meridian, consisting of a gigantic triangular gnomon with the hypotenuse parallel to the Earth's axis. At the sides of the gnomon there is a quadrant of a circle, parallel to the plane of the equator. The instrument aims to measure the time of day, to correct by half a second and the declination of the Sun and other celestial bodies. There are five Jantar Mantar monuments in India, the largest of which is in Jaipur, which presents many instruments along with the largest stone sundial in the world. The Vrihat Samrat yantra is a sundial that can give the local time a precision of 2 seconds. It is a UNESCO world heritage site￼￼. Hawa Mahal (English translation: "Palace of the winds" or "Palace of the breeze") is a palace in Jaipur, India, so it is called because it was essentially a high-screen wall built so that the women of the royal family could watch festivals of road while not seen from the outside. Built in red and pink sandstone, the palace is located on the edge of the City Palace of Jaipur and extends as far as the zenana or female rooms. The structure was built in 1799 by Maharaja Sawai Pratap Singh. He was so intimidated and inspired by the unique structure of Khetri Mahal and built the great and historic Hawa Mahal. It was designed by Lal Chand Ustad in the form of the crown of Krishna, the Hindu god. 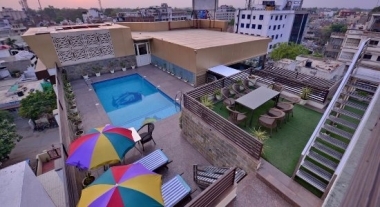 Its exclusive five-story exterior is similar to the honeycomb of a beehive with its 953 small windows called jharokhas decorated with intricate textures. The original intent of the lattice was to allow royal women to observe everyday life in the street below without being seen, as they had to obey the strict "purdah" (covered face). The lattice also allows cold air from the Venturi effect (medical breeze) through the intricate pattern, the air conditioning the entire area during high temperatures in the summer. Many people see the hawa mahal from the street view and thought it was in front of the building but in reality it is the backside of that structure. Then visit the old city of Jodhpur, founded by Rao Jodhaji D.C. in 1459, it is surrounded by a 10 km wall to contain eight ports that serve as input. The new city built around this wall. 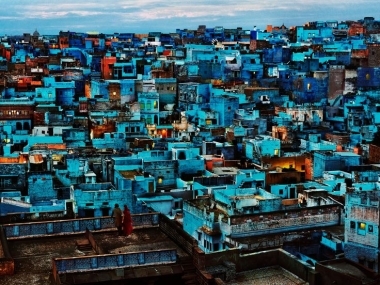 Jodhpur is a delicious mix of modern and traditional buildings. 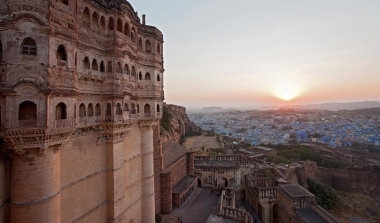 Mehrangarh Fort is the main attraction. Inside Mehrangarh Fort are the famous palaces, Moti Mahal and Phool Mahal. Jaswant Thada is the 19th century royal cenotaph, which is built on thin sheets of marble that allows sunlight to filter. visit the magnificent Umaid Bhawan Palace museum), a portion of Unmaid Bhawan Palace has been converted into a museum. Architectural splendor will surprise you. Bishnoi: a rural tribal group, a Hindu sect founded in Punjab, which follows the teaching of Jambeshwar, a 15th century essay and a religious reformer who left a legacy of 29 (bis us) principles. 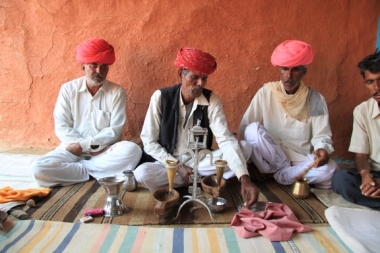 The countryside around Jodhpur is home to many Bishnoi villages in order and family compounds. These kind communities of ceramists, weavers, leather embroiderers and camel herders have gained world renown for their conservative religious convictions. They are vegetarians, they follow the principles of non-violence and above all they reverently protect all the flora and fauna. They do not allow the felling of trees or hunting on their land. This area is home to the rare blackbuck antelope with remarkable spiral horns. (We have seen quite a few pretty creatures.) They graze freely, fully aware, it seems, that no one here will harm them. Bishnoi and opium Although now illegal in India and banned by the 29 Bishnoi princes, the sect still uses it and has received special consent from the Indian government to use opium for "religious" purposes. From a legal standpoint, only empty poppy berries are allowed, after opium has been extracted for medical production. The pods are then ground, mixed with a sugar solution, then further diluted with water for the ceremony. So, actually, it seems that there is almost no opium in the mixture? En Rute You visit Ranakpur Jain Temple. These times are Jain's most renowned times. built in the 15th century covering an area of ​​40,000 square feet with different halls and columns that are individually carved. Ranakpur is a village located in Desuri tehsil near the town of Sadri in the Pali district of Rajasthan in western India. It is located between Jodhpur and Udaipur. 162 km from Jodhpur and 91 km from Udaipur, in a valley on the western side of the Aravalli chain. The nearest railway station to reach Ranakpur is the Falna railway station. Ranakpur is one of the most famous places to visit in Pali, Rajasthan. Ranakpur is easily accessible from the road from Udaipur. Along with the magnificent architecture and numerous pillars, the place is also famous for the large population of monkeys living in and around the place. The ladies of the city donated 90 ounces of gold to the construction of the temple. Ranakpur is widely known for its Jain marble temple, which is said to be the most spectacular of the Jain temples. There is also a small sun temple run by the royal family of Udaipur. Transfer to the hotel upon arrival. Lake Pichola, the beautiful stretch of water that surrounds the two marvelous structures of the Jag Niwas and the Jag Mandir, is the life line of the city of Udaipur. No city in Rajasthan is quite romantic like Udaipur. This picturesque town is located on the shores of Lake Pichola. 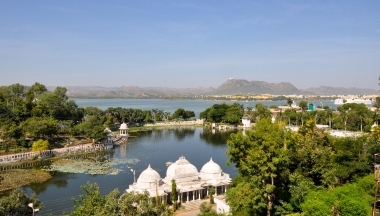 Udaipur is the city of lakes, surrounded by natural and artificial lakes, which are relaxing and crystalline. 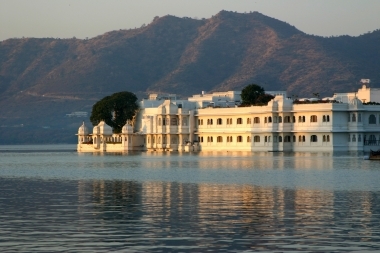 proceed for a sightseeing tour of Udaipur by visiting the city palace museum, the temple of Jagdish and Sahelio ki Baari. 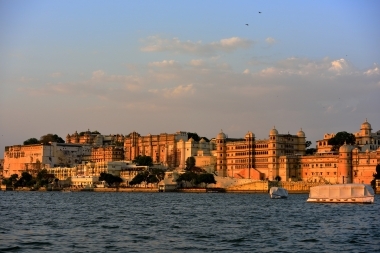 City Palace is the largest palace complex of Rajasthan and is located on the eastern shore of the serene Lake Pichola. Built in marble and granite in 1725 by Maharana Udai Singh. A refined blend of medieval Indoeuropean architecture, you will be amazed by the little lust of its courtyards, overlapping walls, terraces, corridors and lush green gardens. The Jagadish temple next to the City Palace establishes a black stone image of Lord Vishnu and his vehicle - a powerful bird called garuda - in a brass image. The temple is an excellent example of Indo-Aryan art. Saheliyon-ki-Bari -A majestic garden located on one of the shores of Lake Fateh Sagar, Saheliyon-ki-Bari features expensive lawns, shady walking sides and impressive fountains. It is one of the best places in Udaipur to relax. 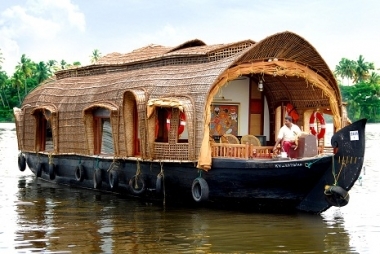 Visit Kumbalangi Village Kumbalangi Village Tours. Kumbalangi is twelve kilometers from Fort Kochi, Kochi. 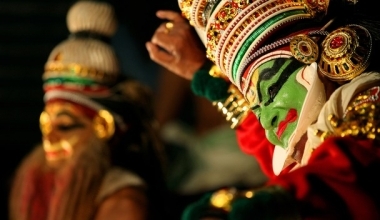 Kochi is an ancient port city along the west coast of the southern peninsula of India. Kumbalanghi is a lush green village of Cochin. It is declared as the first model of fishing and tourist village of India that has its own tradition and culture. Most of the villagers are engaged in agriculture and fishing. 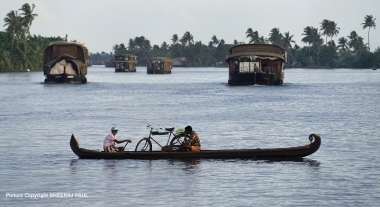 The village is 16 Sq.Km in the area and surrounded by backwaters and rice fields. A ring of Chinese fishing nets literally surrounds the island-village testimony of the rich aquatic life. A series of mangroves separate land from the water that provides a breeding ground for shrimp, crab, oysters and small fish. 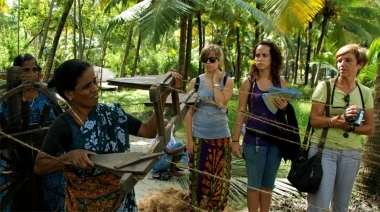 The village is home to all fishermen, farmers, workers, tappers and spinning coir. All Transfers from airport or train to hotel and vice versa according to Program. 15 nights comfortable hotel accommodation, including all existing taxes. Transfers, sightseeing, excursions as per program With air conditioning Private car. Service fee all applicable government taxes. Any dinner or lunch, Health Insurance, Visa, Any Guide, etc. Points of personal nature - such as laundry, bulbs, telephone rings, tips for rooms, tips, personal clothing, including sleeping bags etc. The price for the peak period room, Christmas or new year EVE. Please note that the check-in time is 1300hrs and the check-out time is 1200hrs. Please understand that in the program relating to monuments some are free so if you do not visit we can not repay any money. Names of the hotels mentioned in our offer only indicate that our rates are based on the use of these hotels. It is not intended that the accommodation is confirmed in these hotels until it is communicated to the confirmation of accommodation at these hotels. International flights are not included in the total price. 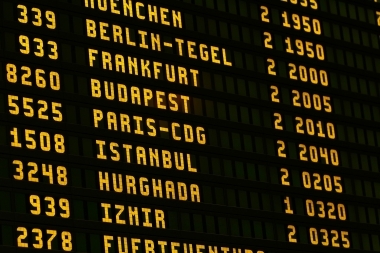 Local operators can also book international flights: please note that you need them when you fill out your request for a quote. Some local operators do not offer this service but they will give you all the information and advice on the best flight. We are at your disposal to help you in the search for international flights and for any doubt. The terms and conditions of booking with Ciao India Tours are listed below .. Reservation ... All reservations must be received in writing by email or fax. Reservations are finalized to receive payment (sent by the Ciao India Tours team) and to receive the information form. All other details are mentioned below. Passport and visa All foreign citizens entering India are required to possess a valid international travel document in the form of a national passport with a valid visa obtained from an Indian mission or a post abroad. For more information kindly visit the link. All passports must be validated at least 6 months after the date of departure in India. The fines, penalties, payments or expenses incurred as a result of the non-regularization of these documents will be the responsibility of the customer. The Ciao India Tours team or Ciao India Tours have no responsibility for the completion of these documents. 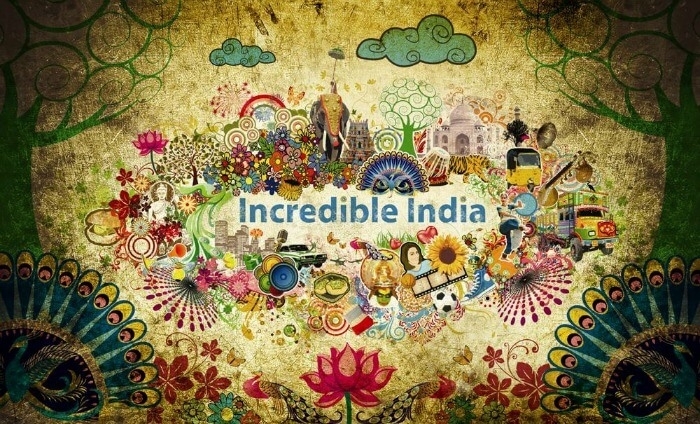 Insurance: Ciao India Tours advises you to take personal travel insurance. The Ciao India Tours team does not provide travel insurance. Payment: an invoice will be raised after receiving the confirmation of services by the traveler with a transfer request transferring the full payment to our bank account in India. 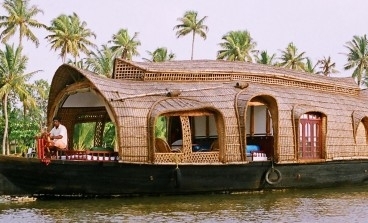 For contracted services, a minimum deposit of 25% of the total cost must be paid M / s Ciao India Tours. The deposit is required to keep the reservation on a confirmed basis. Balance Payment: The balance is paid 30 days prior to the start date of the services. Any booking made within 30 working days from the date of the services will be considered a late booking and for the same the full and final payment must be made at the time of booking. Note: In addition to the above, in case of bookings for luxury train journeys, hotel or resort bookings during peak season (X-Mas, New Year, Pushkar Fair, Diwali etc. ), Full payment must be made at the time of booking. Full payment of Nepal, Bhutan and Sri Lanka is required in advance. 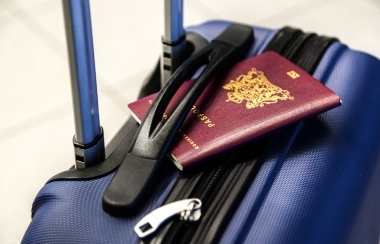 Full payment for domestic or international flight tickets is required in advance. Note All payments must be free and without any withholding tax and deduction. Bank charges, if any, for remittance (by bank remittance or by an intermediary bank) would be strictly charged to the payer. Cancellation policy / NO SHOW / EARLY Departure In case of cancellation of tour / travel services due to any avoidable / unavoidable reason, we must be informed in writing. The cancellation fees would be effective from the date on which we receive a message in writing and the cancellation charges would be as follows. Cancellation: Cancellations more than 30 days before departure date: 50% of the deposit will be refunded after deduction: bank charges (€ 20), booking cost (€ 45), flight cancellation (€ 20 per person and 100% of the cost Be deducted) and the current cost of train tickets. Cancellations less than 30 days before departure: 50% cancellation fee. CIAO INDIA TOURS keeps 50% of the deposit paid upon confirmation of booking. Cancellations less than 21 days before departure: 100% cancellation fee. Ciao India Tours keeps 100% of the travel cost. Note: Regardless of the above cancellation plates - in case of cancellation of tour / trip services after the booking made with us - a minimum service charge of 10% will be applied. In case of cancellation of the trip after the start, the reimbursement would be limited to a limited amount that also depends on the amount that we could recover from hoteliers, airlines and suppliers that we will protect. For unused hotel facilities, transportation of rentals and missed meals, etc. We are not responsible for the refund. In the case of a special train trip (such as the Palace on wheels, the royal Rajasthan on wheels, the odcan of Deccan, the golden chariot, the Indian Maharaja and Maharajas Express), a separate cancellation policy is applicable ( recommended as and when required). . If the reservation for the next period is canceled, due to any reason, no refund will be made for this cancellation. High season bookings (from December 20th to January 15th) Period Festival Bookings (Festivals like -Diwali, Dussehra, Holi, Pushkar and so on). Reservations along the weekend. Reimbursement: Regarding the reimbursement of unused / unused services (which are paid and canceled in advance), the amount of 12/14 Maria Pia 2018-12-29 restitution will be processed on the basis of the cancellation policy as above described and the money will then be reimbursed to the person / agency who made the payment to us. Please note that the refund process can take 2 - 4 weeks due to bank procedures. If the refund is made to the credit card account or bank account, the bank charges would be debited from the refund amount. Check-out time: 1000 - 1200 hours. Late check-out is available on request and subject to availability / payment. Extra use of the vehicle: Please note that the cost of the extra use of vehicles (cars / cars with the driver) is not included in the services and therefore the extra use of the vehicle after the transfer or after the show is not allowed unless it is mentioned in the detailed itinerary / services. The travel time indicated between the cities is indicative and subject to traffic conditions. 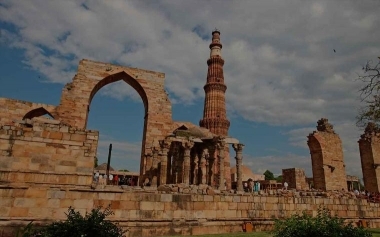 Our responsibilities and limitations: After the conclusion of the cost of the tour / service, if there are inbound tours of monuments / museums, taxes, fuel costs or driving costs from the Government of India, which are outside the our control, the same would be charged as extra. 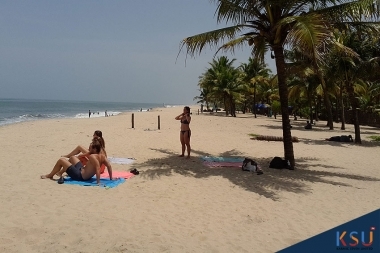 The rates of Ciao India Tours are based on prevailing rates negotiated with suppliers. Hotels and airlines retain the right to change the rates without notice. In the event of such change - the rates quoted by us before the change can be changed by us based on changes made by hotels or airlines. Ciao India Tours and its employees act only as agents for hotels, airlines, carriers, railways and contractors who provide other services. All vouchers, receipts, contracts and tickets issued by us are issued under the conditions and conditions in which these services are provided by them. Tickets, vouchers or the contract of passage in use by a career / hotel or other contracting parties that perform representation services constitute the only contract between the Customers and that contractor. The itineraries of Ciao India Tours are sample itineraries, with the aim of giving a general idea of ​​the probable travel program. Numerous factors such as time, road conditions, physical capacity of the participants, etc. They can dictate route changes before or after the tour. Ciao India Tours reserves the right to change any aspect of the itinerary, including transportation and accommodation without prior notice in the interests of travel, safety of participants, comfort and general well-being without any reimbursement, indemnity or reimbursement. The additional cost, possibly due to such unforeseen circumstances that outside of our control, must be paid by the customer. Ciao India Tours is not responsible for any delay or modification of the program or expenses incurred or losses, injuries or special or consequential damages, directly or indirectly, due to natural hazards, flight cancellations, accidents, breakdown of machinery or equipment, breakdown transportation, weather, disease, landslides, political closures, acts of God, dangers to the sea, floods, fire, acts of government Or any other authority, wars, civil disturbances, riots, thefts, thefts, epidemics, quarantines, medical or personal health departments, defaults or any other cause beyond our control or unforeseen accidents or any other cause, including any liability or additional costs incurred by customers. Furthermore, Customers will be liable for the liability or additional expenses incurred by him due to lost causes. Ciao India Tours reserves the right to cancel any service if it considers the tour, the journey or the passage is feasible for any reason or if circumstances justify it, the reimbursement of its value and the client will have no other or another request against the For any reason. Ciao India Tours reserves the right to refuse the execution of its contract with any person who may be considered undesirable in its absolute discretion and is not required to show any reason to do so. The government has introduced "no smoking" legislation for hotels, restaurants and all public places. The hotel has smoking rooms for smokers. If you would like a smoking room, please send us your request and we will try to book the same thing for you subject to availability.